UP Police SI Online Exam Cancelled due to Technical Fault Leak: So UP Police declared its Sub Inspector exam cancel which was scheduled to be held on 16 & 17-07-2017. A bad news for candidates who has well prepared for UP Police SI Online exam. UP Government had organized Online test for UP Police SI on 25 & 26th July, 2017. News was spread across the candidates that UP Police Recruitment Board will be cancelling the Sub Inspector (SI) Examination due to the technical fault in computers at various exam centers. UP Police SI Online Exam canceled. Check notice..!! As per the official notification published by UP Police Recruitment Board, Government of UP, There was server issue in UP Police SI Online Exam and now new exam date will be conducted. It is being said that the examination management team has faced server issue in computer to be used for the UP Police Sub Inspector online examination 2017. It is now confirmed by official, due to the technical fault in computers the UP Police SI exam cancelled. 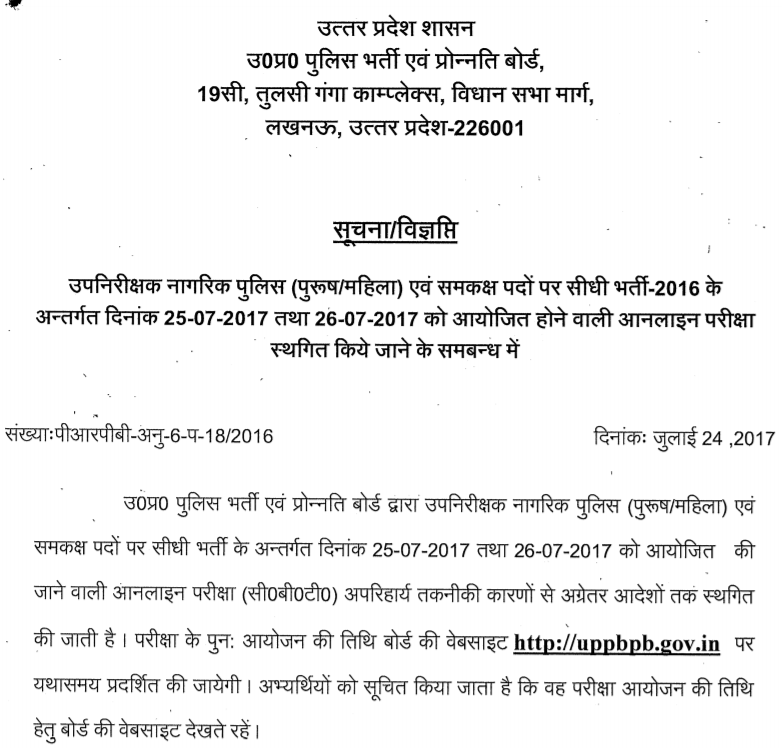 Check out the Cancellation notice of examination for the post of UP Police SI Online Examination. Due to Technical Fault in Computers the UP Police SI Online examination dated 25-07-2017 & 26-07-2017 for the post of (Sub Inspector) stand cancelled till next notification. New Examination date will be announced in due course. Now confirmation has been made by the Uttar Pradesh Police Recruitment & Promotion Board and investigation is ended up. They got the rumour right that UP Police SI exam couldn't be conducted successfully due to several issues including Technical Fault, Center manage, cheating and corruption at various examination centers. This leads to UP Police SI exam cancellation in Uttar Pradesh. So these are the reasons that resulted in reschedule of UP Police Sub Inspector Exam which was to be held on 25 & 26/07/2017.